Rubenerd: Voting for Ray Foley for an Irish Meteor! Voting for Ray Foley for an Irish Meteor! 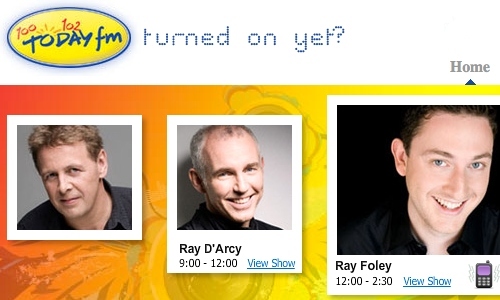 Just a quick post to inform you all I voted for Ray Foley for the Irish Meteor radio awards! Not sure if international SMS text messages are counted, but budda diddly boom! "The Ray Foley Show… Today Eff Emm!" While we were driving around Europe we decided to flick through local radio stations, and by far our favourite DJs from the whole trip were Ray D'Arcy and Ray Foley from Today FM in Ireland. They're banter literally became a highlight of the trip, so much so that we'd often dordle in the car outside a major tourist attraction so we could finish hearing them ramble and rant on an idea before we got out. We noticed while we were there the Irish sense of humour is surprisingly close to the Aussie one… perhaps because of our common heritage of British oppression ;).